I began this project back on February 16, 2009. Since I began, many others have joined in on the meme. I am thrilled that this meme I started has inspired so many to transcribe and share their family history documents. Why do we transcribe? I provide my three reasons in the linked post. You may find others. This week I transcribe the obituary for my wife's second great grandmother, Anna Marie (Taylor) Gober. Mrs. Anna Marie Gober, wife of Lewis P. Gober, died at the family home in Vanduser Monday morning at 1 o’clock. She was born May 23, 1873, near Illmo, the daughter of Andrew and Drucilla Taylor. Funeral services will be conducted Wednesday afternoon at 2 o’clock at the Methodist church in Vanduser by the Rev. Levi Bess. Burial will be in the old Morley cemetery. The body is to remain at the Welsh Funeral Chapel until time of services. She was married to Lewis P. Gober January 6, 1891, and they were the parents of eight children, six of whom preceded their mother in death. Mrs. Gober is survived by her husband, a prominent farmer of the community, and two children, Robert Gober of near McMullin and Albert Gober of St. Louis; four sisters, Mrs. Amanda Bess of Marquand, Mrs. Hannah Greer of Vanduser, Mrs. Matilda Crutchfield of Sikeston and Mrs. Ada Boney of Morley; seven grandchildren and four great grandchildren. 1) I have previously transcribed the obituary for Anna's husband, Lewis (or Louis) P. Gober. 2) I am appreciative that whoever wrote the obituary went against the cultural norm, and actually listed the given names of the sisters, instead of identifying them by their husband's names. Amanda Bess's husband was Noah Charles Bess. I haven't yet figured out if or how Noah was related to the Rev. Levi Bess. This week I transcribe the obituary for my wife's second great grandmother, Verba Elle (Blackman) Fulkerson. Mrs. Verba Elle Fulkerson, 89, died at the home of her daughter, Mrs. Robert Gober, of near Morley, Wednesday morning, after a prolonged illness. Born December 10, 1857, Mrs. Fulkerson had been a resident of Morley and vicinity for 40 years. She is survived by five daughters, Mrs. Virgil Williams, Memphis, Tenn., Mrs. John Healy, Dexter, Mrs. Ella Huey, Mountain Grove, Mrs. Ellis Alcorn, Sikeston, and Mrs. Robert Gober, of near Morley, One son, W.O. Fulkerson, Bloomfield, 46 grandchildren and 62 great grandchildren. Funeral services will be held Friday afternoon at 2 o’clock with Rev. Freeman Unsel officiating. Burial will be in Blodgett cemetery. Welsh service. 2) Mrs. Virgil Williams is her daughter, Julia, Mrs. John Healy is her daughter, Bertha, Mrs. Ellis Alcorn is her daughter, Urista, and Mrs. Robert Gober is her daughter, Mabel. The daughters are listed in chronological order. W.O. Fulkerson is William Otis Fulkerson. 3) "Welsh Service" is a reference to Welsh Funeral Home, which today is Ponder Funeral Home. 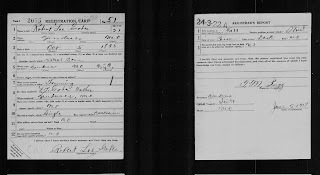 This week I transcribe a World War I registration card, and a newspaper clipping from 1918 concerning my wife's great grandfather, Robert Lee Gober. 6) If not a citizen, of what country are you a citizen or subject? Mrs. Louis Gober, of Vanduser, and her son Robert, who is home on a ten day furlough from Camp Funston, were in Sikeston Tuesday afternoon. 1) Camp Funston was a U.S. Army training base located in Manhattan Kansas at Fort Riley. 2) Even short social news clippings can reveal important information - such as which army base someone was located at. 3) The gravesite of Robert Lee and Mabel (Fulkerson) Gober - photograph taken July 3, 2015. This week I transcribe a newspaper article from 1918 mentioning the divorce of a great uncle. George Meade and Frank P. Bell are named as correspondents in the divorce suit of Stanford O. Van Every against Amy Van Avery. Alice O. Hartley alleges failure to provide against Sydney R. Hartley, and cruelty is the allegation of the complaint of Sarah C. Porter against Richard Porter, whom she married in Butler county in 1899. 1) Stanford Van Every (aka Samuel Van Every), was the brother of my maternal grandmother. 2) Amy Johnston and Stanford O Van Every were married in March of 1917. In July of 1918, Amy wrote to the FBI and accused her husband of bigamy, draft evasion, and pro-German sympathies. This news clipping suggests Stanford filed the divorce suit again his wife. This news article provides a county court to contact to see if the divorce records survive. It also provides some possible associates of either my great uncle, or his wife. 3) I am unsure if the Hartleys mentioned in the same news clipping are related to my Hartley ancestors. It would be highly coincidental, since my Hartley ancestors resided mostly in Texas and Mississippi. Three years ago I wrote a post concerning all of my ancestors and where they were during the Revolution. My ancestor David Van Every served a few months in the New York Militia, but he became a United Empire Loyalist like his father. And since there is no indication that his father's loyalties were ever in doubt, it might be fair to wonder if those few months in the New York Militia were entirely patriotic. 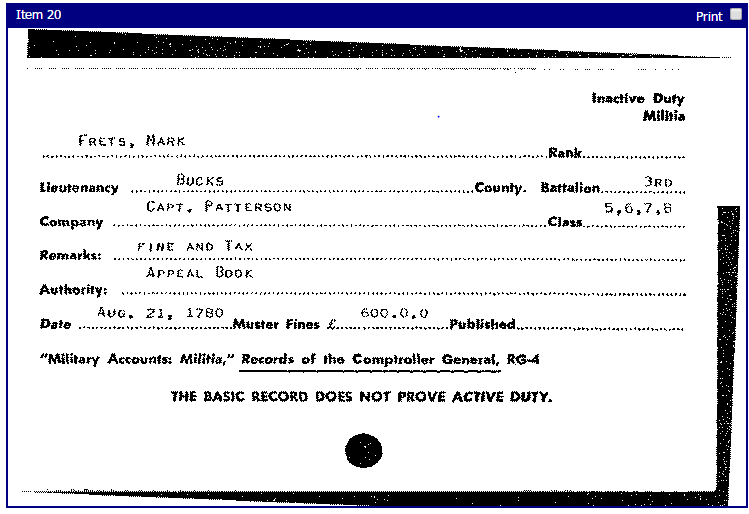 He did have uncles and cousins serving patriotically, so it's possible, and there is some evidence he may have signed up for the militia honestly, which I will go into in another post, but there is enough doubt I knew I would feel uncomfortable using that service to claim descent from a Patriot. I hadn't completely given up hope of finding a truly Patriotic ancestor, but figured the only branches would be the ancestors of my maternal great great grandmother, Sarah Hartley Denyer. Born around 1836, I'd have to research back to her grandparents and great grandparents. 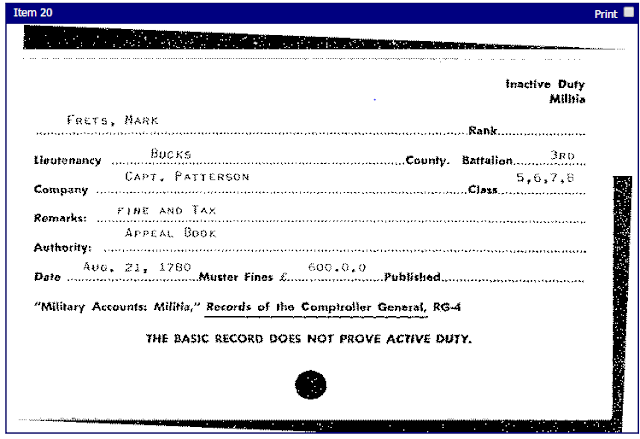 I was plugging in some surnames into the Daughters of the American Revolution (DAR) databases recently for fun, and found a different ancestor, my fifth great grandfather, Mark Fretz. 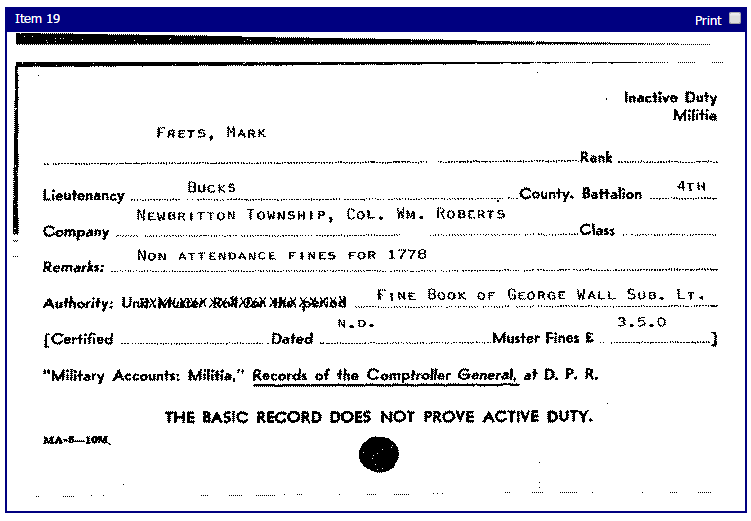 It appears Mark Fretz paid fines for the privilege of not actively serving in the militia. If I am reading the card correctly, and if the abstract from the original record is correct, in 1780 he paid 600 pounds, which would have been a significant amount in 1780. So my ancestor, Mark Fretz, would be considered a Patriot under that definition. I am proud of his dedication to his religious principles, however, he didn't serve in the militia. While I would like to find an ancestor who was an active Patriot, since the Daughters and Sons of the American Revolution organizations accept those pacifists who paid the fines as suitable ancestors, I wouldn't feel bad about using Mark Fretz for that purpose. Becoming a member of the Sons isn't on my high list of priorities right now, though I realize some kin might feel different. So the question arises: Could I, or a cousin, prove descent from Mark Fretz to the satisfaction of their guidelines? My great-grandparents, Melvin and Margaret Jane (Denyer) Van Every appear in the genealogy, along with their first three children. I am confident I can prove up to there with vital records. However, looking at the guidelines on the lineage society websites, they rarely accept family history publications that don't contain source annotations. Regardless of how accurate I may feel the work to be, it isn't annotated. So, removing it as a source, what other sources are there? They are likely to accept the lineage information provided within the testimony to the Dawes Commission. (The Dawes Commission rejected their claims to be of Choctaw descent, but not their testimony of how they were all related to each other.) My grandmother is mentioned in the testimony, as she was born a few months prior. My second great grandmother, Sarah (Hartley) Denyer is also mentioned. She died two years prior to the testimony, but her brother testified. I have a copy of the 1854 marriage certificate for Sarah Hartley and Ebenezer Denyer. Can I connect Ebenezer Denyer with Mark Fretz with acceptable records? The answer lies in Bucks County, Pennsylvania. Ebenezer was born there, as was his mother, Elizabeth (Sliver) Denyer, grandmother Barbara (Fretz) Sliver, and his great-grandfather, Mark Fretz. [His mother and grandmother both died in Texas, which would be helpful in proving that he is the same Ebenezer Denyer.] There is a good chance it could be done.